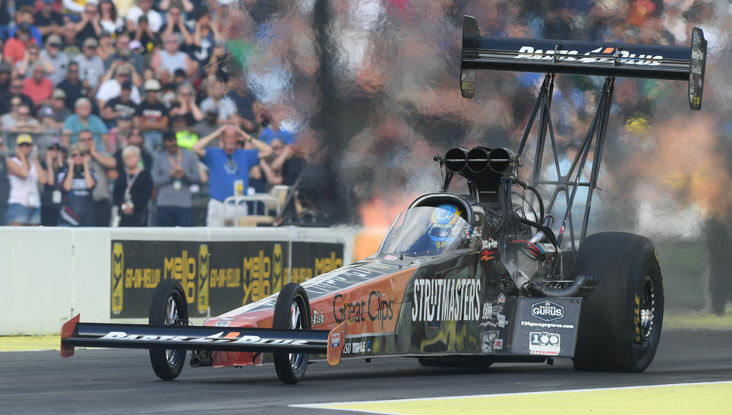 Top Fuel points leader Steve Torrence hasn’t had many hiccups in his breakaway season, but the talented Texan says he will have his mental game squared away today after red-lighting in the first round against Doug Kalitta last weekend in Sonoma. It was his first red-light since the 2013 Brainerd event and didn’t cost him his point lead –- and not much probably can –- but it still needs to be addressed. “There’s no way to put lipstick on that one and making it look any better,” he said. “Sometimes you just make mistakes. It was a long Tree. I knew that when I hit the gas it was a crapshoot because I saw the light coming on as my foot was going down and maybe that I just caught it, that I met it coming on. I’ve driven these things long enough to just throw that out the window. The guys were super supportive and, in the end of he day we weren’t going to win that round anyway. We went .77 and Kalitta went .74; he was .060 on the Tree so I’d have had to been .030 or better to even have a shot. 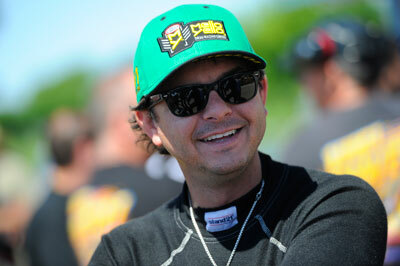 He enters eliminations today as the No. 1 qualifier with a seven-round lead over Tony Schumacher and thinks he can hold onto the lead through the end of the Chevrolet Performance U.S. Nationals, which offers a points-and-a-half windfall. At one point this summer, after his back-to-back wins in Topeka and Chicago, Clay Millican was just 25 markers behind points leader Steve Torrence. The last half-dozen races have not been as kind to the Doug Stringer’s Great Clips/Parts Plus team, which now finds itself in third place, 143 back of Torrence but just six points behind second-place Tony Schumacher. Millican’s downward trend began at the race after his Chicago victory, when he red-lighted in round one in Richmond, where Torrence won the event. “Self inflicted injury,” he confessed. “I just screwed up. I knew I was hitting the pedal too soon. 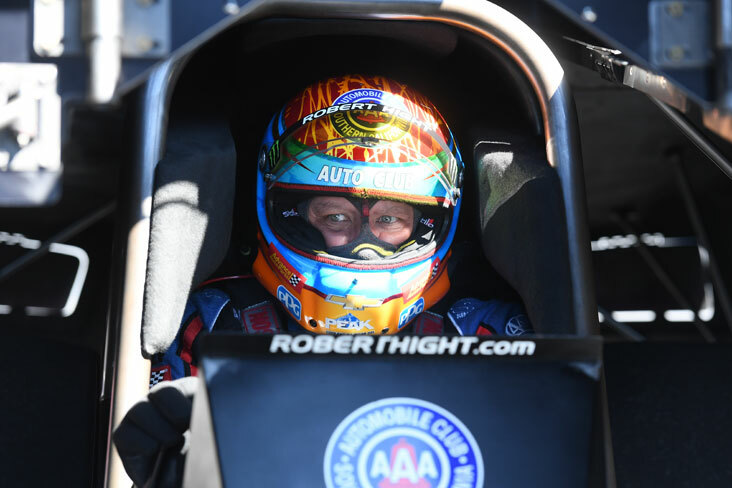 Your brain is going ‘it’s not time, it’s not time.’ That was only second red-light in 20 years in NHRA; I don’t think I had many more than that in IHRA, but it’s one that hurt us. In Norwalk we ran a supercharger one more round than we probably should have and got outrun by Leah [Pritchett]. Last week in Sonoma we smoked the tries when it shouldn’t have and we lost. Schumacher smoked the tires, too, and won his round. After Brainerd, the team will head to the Don Schumacher Racing shop to get their dragster front halved, then take part in the pre-Indy test (a rarity for a team that never tests), where they’ll also be doing tire testing for Goodyear. The Western Swing has only been swept once in Funny Car, when John Force did it 24 years ago, but his entire team is hoping for the next-best thing: a team sweep. With Force winning in Denver and Robert Hight scoring last weekend in Sonoma, there’s definitely a solid possibility they can pull it off again, as they did in 2014 when Hight won in Denver, Courtney Force scored in Sonoma, and the boss finished it off with a victory in Seattle. In 2016, John Force won the first two legs but was upset in round one in Seattle by Tommy Johnson Jr. Force also came close in 2003 by winning in Denver and Seattle (when the middle event was reversed) but fell short of another sweep when he lost in the semifinals in Sonoma to Gary Scelzi. In 1996, two years after his initial sweep, Force won in Denver, was runner-up to Cruz Pedregon in Sonoma, and then won in Seattle. Hight, who was a semifinalist in Denver, might have the best chance at completing the sweep. He’s the defending event champ and, as his team did last year, they’re finding their groove just in time for the stretch run of the regular season. 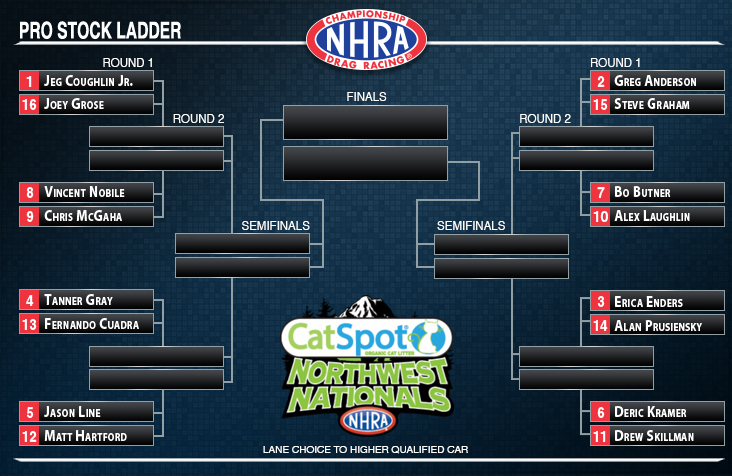 It seems like a long time ago, but there was a period where Tim Wilkerson was unbeatable in Seattle. Wilk won three consecutive Northwest Nationals from 2009-2011 – beating a trio of past and future world champs in Tony Pedregon, Ron Capps, and Jack Beckman in the final rounds – and would love to add a fourth Seattle victory this weekend to supercharge his bid to make the top 10 and compete in the Countdown to the Championship playoffs. 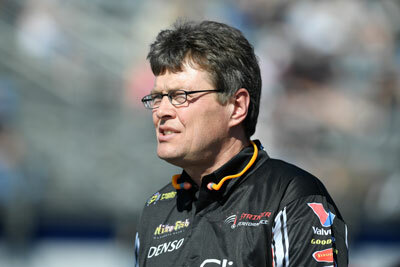 Wilkerson enters eliminations in the No. 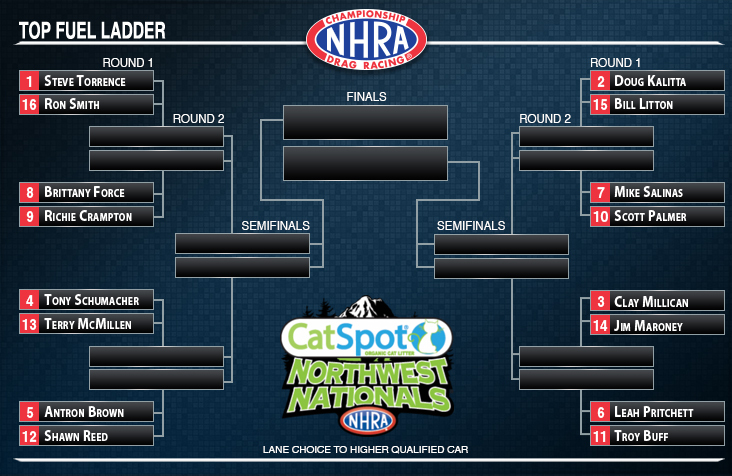 11 position, just 28 points out of the top 10, chasing Bob Tasca III and, above him, Shawn Langdon. Wilkerson hasn’t been in the top 10 since the season opener, where a second-round finish ranked him sixth. 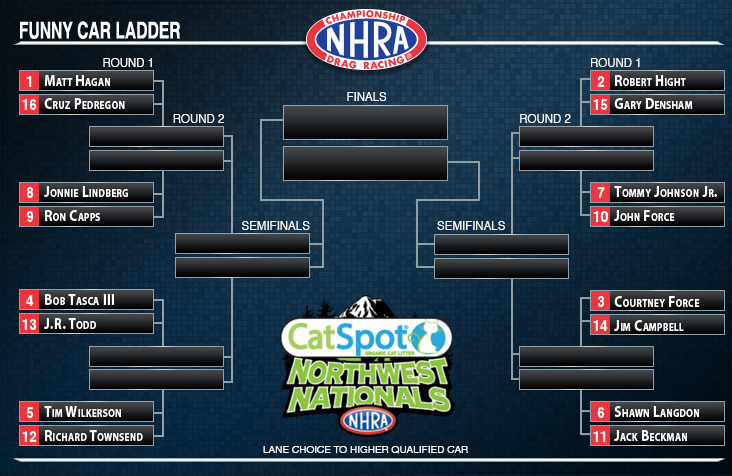 He slipped as far as 14th at one point but a runner-up in Epping got him to 12th, and a round win in Denver got to No. 11. 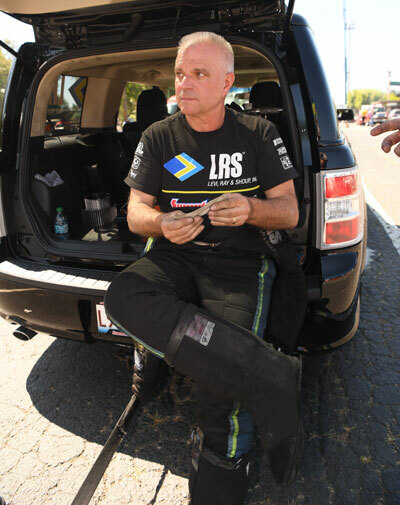 The good news for Wilkerson is that he could race Tasca in round two, if both win their first-round races, Wilekrson against Richard Townsend and Tasca against J.R. Todd. “We gotta make it to second round before we can start thinking about that,” said Wilkerson. “There are no gimmes. These cars are all running well, and you’ve got to beat them all. Townsend is no pushover, they proved that they can run good. We just need to run our race, worry about our lane, and then whoever is tin the next round is who we’re running. Even though he races out of the KB Racing stable that boasts world champions Greg Anderson, Jason Line, and Bo Butner, Fernando Cuadra, competing in just the fourth race after a 14-year layoff, may not be a household name, but that certainly will change in the future. 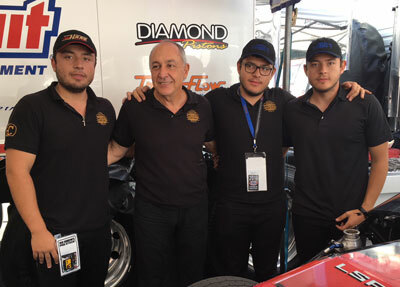 Cuadra should soon be joined in the class by his sons, Fernando Jr. and Christian, as well as Julio Rodriguez, a championship engine builder and racer in Mexico’s Pro Stock equivalent. He’s collecting cars, including Line’s 2011 championship car, a Mustang, and the ex-Erica Enders Dart, though all will have KB Chevy power. Additionally, Cuadra’s fourth son, David, is going to be working through the Top Sportsman ranks will an eventual eye on Pro Stock as well. 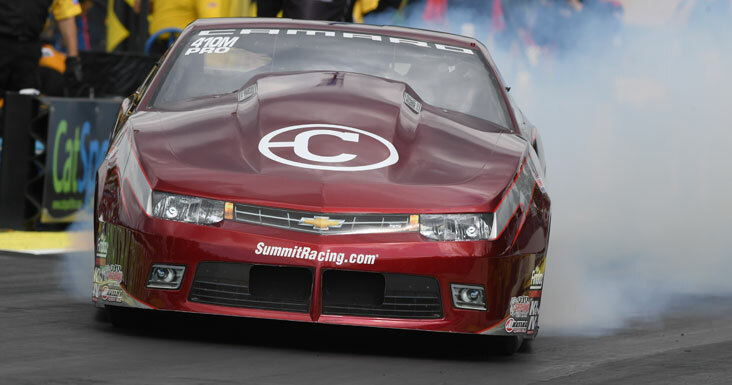 The Seattle event marks just the fourth event for Cuadra himself, and it’s been a mixed bag of reaction times, with some killer lights and some red-lights as he gets accustomed to Pro Stock power again. “We’ve changed clutch pedals and linkage to get used to the clutch,” he said. “When you rev up the engine the clutch pushes back your foot, so first I was red-lighting, Then I was pushing harder [to hold the pedal down] and then I was late. These are all tricks that I didn’t know. Cuadra, who funds his racing through his Corral Boots company, is also using racing as a proving ground for his footwear. Various members of the KB team are trying either shark- or ostrich-skin models as well as soles meant to handle oil and gasoline. 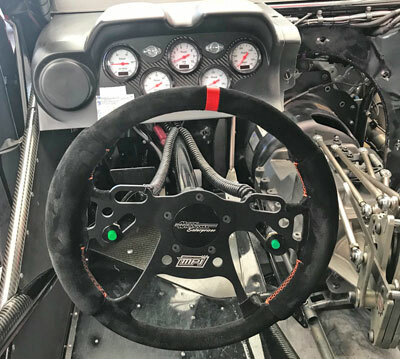 “I didn’t necessarily decide I needed a new steering wheel, but I saw this one and it definitely looked like something that work better and be more comfortable,” said Anderson. “It’s lighter weight, it’s a stronger piece, and it’s aesthetically good looking – so maybe for the in-car camera it upped my image a little bit. “I don’t know that it changed my driving at all, but it’s definitely more comfortable to the feel because we’ve just been using a generic racing steering wheel. This one is targeted towards what we do in a Pro Stock car, the feel of it, the buttons we use. It’s exactly what we needed. Tanner did a good job.